Sleep on a Beautyrest Mattress and wake up rejuvenated. The sophisticated design and intuitive technologies found in the Silver Collection help provide comfort, support and pressure relief. Try it for yourself and you'll see. Beautyrest Silver is an elevated sleep experience that gives you pure sleeping satisfaction so you can reach your best every day. 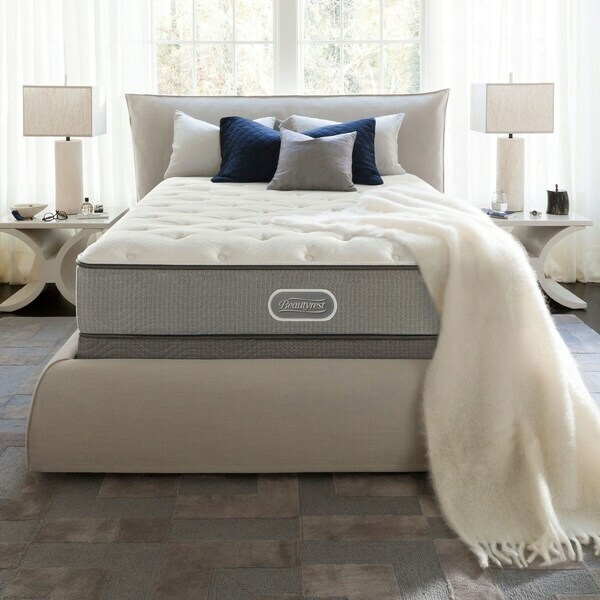 This model features: DualCool Technology Fiber - A soft, supple fiber designed to move both heat and moisture away from the surface of the Mattress, also enhanced with silver to prevent the growth of stain and odor causing bacteria, mold and mildew, in the fiber, to help keep your Mattress fresh. GelTouch Foam - A soft gel foam that provides soothing comfort with exceptional surface contouring and conformability. AirCool Foam - A channeled surface design that promotes airflow through the Mattress. AirCool Gel Memory Foam Center Third Support - This memory foam utilizes the unique properties of gel helping to provide both pressure point relief and a cool comfortable sleep environment. Beautyrest Pocketed Coil Technology - Hundreds of individually wrapped plush coils adjust independently to the weight and contour of your body giving you conforming support and motion separation for an undisturbed sleep. AirCool Ventilated BeautyEdge - the proprietary ventilated edge promotes airflow while offering 30% more edge support than the previous Recharge line and provides a firmer more stable edge.